They say 40 is the old age of youth, 50 is the youth of old age. Now that I've reach the ripe, old age of youth, I can't say I feel any different. That I'm on the cusp of old age, of walking the path of behaving as an older pers on would. I suppose the fact that my knees have been hurting more than ever, with the slightest exertion triggering off a bout of stiffness and pain, reminds me that I am getting old(er), the physical machine that is my youthful-looking body is actually older than it appears to the outside world. My knees keep me feeling older than I actually am. So I guess in many ways I feel much younger than my biological age, and yet in one respect, I feel a lot older. The big 4-0 celebrations started on the eve of the big day with a trio of little birthday cakes/ pastries courtesy of the girls at the office. I received a lovely glass teapot which I've always admired and debated if I need yet another teapot just so that I can see beautiful tea leaves especially those in the form of a flower, bloom into a lovely form in the transparent glass. The love of a beautiful object is overpowered by the knowledge that I already have 2 teapots that I use very often plus a ceramic coffee pot which I don't. I could not justify yet another teapot. But it is a different story when someone presents you with one as a gift. 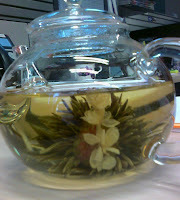 I inaugurated this beautiful pot with 1 of the tea leaves bloom that came as part of the birthday gift. The bloom was just gorgeous and it opened up pretty spectacularly, almost like a little garden in itself with different flowers held together so tenuously. It was a visual treat as much as one for the taste buds. On the actual day itself, we took a day trip up to the Southern Highlands and had a wander around Bowral and Mittagong, 2 quaint villages. I had the best chicken and leek pie for lunch at an award-winning patisserie in Bowral, and so bought a cold lamb and rosemary pie for my dinner later that evening, to be heated up in the oven when I got home. Unfortunately, that was nowhere near the standard of the first pie and I was sorely disappointed. Luckily, redemption was had in the pear slice and mocca chocolate tart we also bought for our after dinner dessert. The chocolate pistachio macaroon was however, a letdown. I don't think any macaroon I've had so far in Australia has been satisfactory actually. We found the Sturt gallery at Mittagong this time and I was tempted by some beautiful ceramics. But bearing in mind my imminent unemployment, I curbed all thoughts of support ing any local (starving) artist and instead chose to preserve some wealth to support my (possibly-to-be-soon-starving) self. On our way back, we stopped at Howard Lane vineyard and G bought a couple bottles of wine, 1 of which was a sweet chardonnay which was quite unusual but probably up my alley exactly because it was sweet. We thought we would bring it with us to the birthday kaiseki dinner we were going to have at Mino the next evening with 3 of my closest friends here. The kaiseki dinner was my fourth experience there. But still as good. The 2 kaiseki menus had changed a little bit, possibly to factor in seasonal changes for what is available. The courses were presented in the beautiful manner typical of the Japanese. Everything looked like a work of a rt, to be carefully picked up and slowly savoured. The little pieces added up to a big meal, we were all groaning that we were full even before the main course arrived. I particularly like the entrees of seared scallops with ebi roe and the asparagus and duck deep fried in blue cheese. My salmon main course had a nice miso paste type sauce. I stuck with the usual green tea ice-cream while the others went for more exotic choices of black sesame (not one of my favourites) and fig and pistachio (which I was tempted to go for and which was the highlight of all the ice-cream choices I reckon). The creme car amel in the shot glass was so yummy everyone wished the portion was larger, even after swearing that we all couldn't eat anything more after our main courses. I missed the chocolate coated in soy powder which wasn't part of the set this time, but I guess the creme caramel was not a bad substitute. So that was my 3-day significant birthday long weekend celebrations. Life's pretty good when you're surrounded by family, friends and good food. No longer enjo ying the convenience of having a vast selection of eateries (cheap and not-so-cheap) at our door step, we started cooking even more than before. Our new grocery bills easily tripled our old bills when we were living in Surry Hills. Our repertoire is not wide, but is probably sufficient for us, for now. We still eat a lot of fish but G says he will start eating meat (sometime, some day, somehow). If one doesn't live in hope, what else does one have? And so, I hang on, hoping that he will see the light and we can start introducing meat into our meals. It is hard to cook meat just for one person and so I never do, and end up eating fish all the time at home. Which explains why I choose meat (any meat! I am not discriminatory when it comes to meat) every single time I go out to eat, I am probably extremely iron deficient. In a not-so-typical dinner we had over the long weekend just past, we decided to assem ble some fresh oysters for starters, sour dough bread from my fave bakery, Bourke Street Bakery, a couple of different cheeses, smoked salmon and trout, avocado and tomato for a tasty and quick meal. I also made a salmon roulade, courtesy of my MIL's recipe which we generously slathered onto the bread. This is such an easy but delicious spread to make. It is going into my recipe archives for future English high teas and picnics. And we topped off with dessert from Bourke Street Bakery as well, a vanilla & strawberry creme brulee tart and a lemon curd tart. They were absolutely delicious, I can't decide if I like the creme brulee with the caramelised crispy shell or the tangy kick of the lemon curd better. They are both addictive - and probably very fattening too, which makes them so yummy I guess. The same morning, by a stroke of luck, was also the Surry Hills markets day and we were in the neighbourhood. So we tra wled through the stalls and I didn't have to go far. The first stall I stopped at, I spied those vintage pressed glass jelly moulds that I had been eyeing for a while. They were extremely well-priced and I dithered between the 2 of them, one had a diamond top and the other was oval with the dimples. I turned to G for a second opinion and in his infinite wisdom, suggested that I ask the seller if I could have both of them for a discount of a third off. I offered, she accepted and a deal was had. I was the proud owner of these 2 lovely glass jelly moulds, circa 1940s-1950s. I inaugurated them that night with port wine jello but the consistency of jello is not optimal for these moulds as they are too soft to unmould properly. I will put them to the agar-agar test and I'll bet they will come out beautifully. Good food and finding flea market treasures. 2 of my favourite things. What more could a girl ask for? Time to take stock. In another 2.5 weeks, I will close this chapter of my life. It has been a good 12 years and a vast proportion of my working life so far. Many friends have been made here, sweat and tears all blended in, lots of laughter and lots of hugs. I remember all the good times, I remember all the good people. This place made me. The people made me. The work made me. I know when I walk out that door, I leave behind a bunch of people I have come to love and respect. But I know they will stand behind me, and as time has shown before, leaving the physical place does not mean leaving the emotional space. The people who have shown me the support will continue to do so wherever I end up. I will miss the ease of picking up the phone, the instant messaging, the internal email system that allow seamless communications whenever one feels like chatting to a work friend just to say hello or for a quick whinge. But I go with the knowledge that this is not a full stop, this is just a semi-colon. I won't be saying goodbye, I'll be saying see you later, guys.